Before I got into what I think of the movie, let me start by saying this, and this something I have always said to pretty much anyone that listens: I don’t mind remakes/reboots. The original movie will always be there. The day that remakes/reboots comes out and Hollywood decides to burn all original copes of the original movies so we can never see them is the day we can start bitching and moaning that remakes shouldn’t happen. My only thing about remakes/reboots is that they at least try to do their own thing with it, but at least keep some of the spirit or charm of the original if it’s possible. 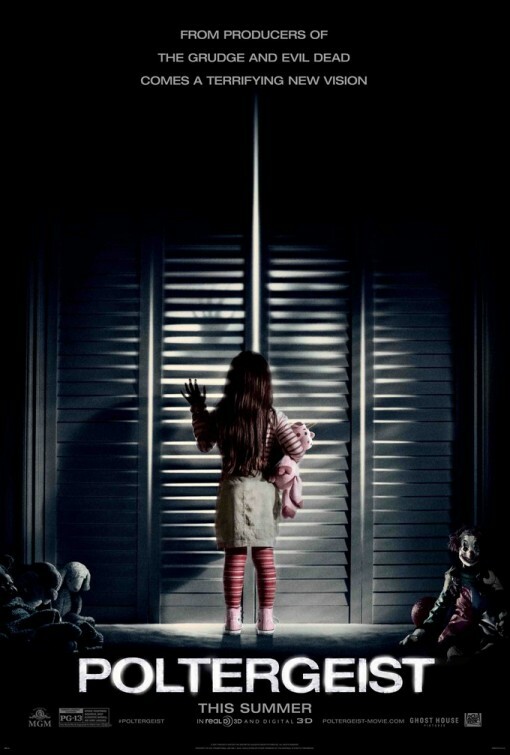 Did we need a remake/reboot of Poltergeist? Probably not, but it is here, so deal with it. Also, I will not compare this to the original movie, I don’t really do that in my reviews and never will. I’m judging this movie for what it is, and not what it was and turned into. 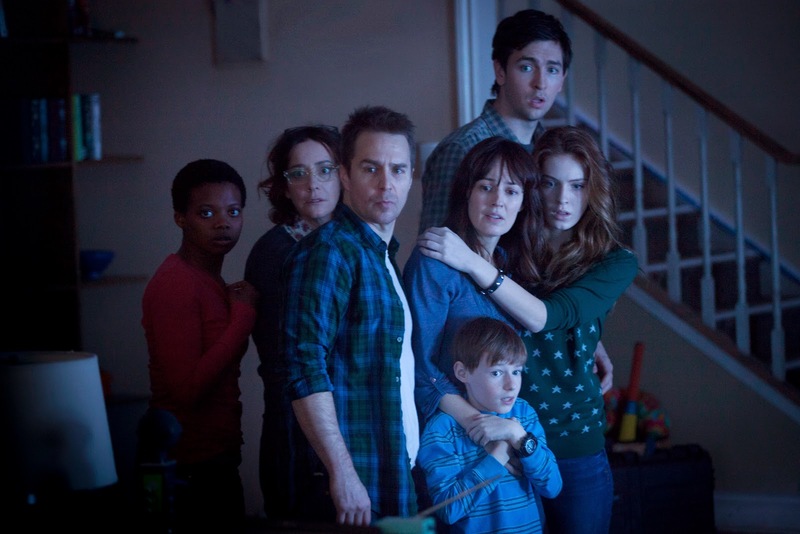 Poltergeist follows a family five in the Bowen family; the recently out of work father, Eric (Rockwell), the stay-at-home struggling mom Amy (DeWitt), the teenager Kendra (Sharbino), the youngest Madison (Clements) and the scared of many things and middle child Griffin (Catlett). They move into their new house, which they can barely afford but as soon as they move in, both Griffin and Madison start to encounter strange happenings around the house. Eventually, Eric and Amy find out that the land the house is built on was built on top of a cemetery, but by then it is obviously too late. The spirits target Madison, because she is still innocent enough to not know they are really evil and lure her into her closet and to the other side. On the other side, Kendra and Griffin get attacked as well before their parents come home and find out that Madison is missing. They find out that Madison isn’t really missing of course and instead has crossed somewhere they can’t reach her. Amy and Eric don’t to the police since Eric says “who will believe us?” and Amy goes to Dr. Brooke Powell (Adams), a professor and expert on Paranormal Research. Powell helps the family with her two assistants Sophie (Heyward) and Boyd (Braun), but when they find out that they are a bit out of their league they get Carrigan Burke, a famous TV host of a show called Haunted House Cleaners. Burke tells the family that they need to work together in order to bring Madison home back safe. Poltergeist has no problem going into the strange occurrences very early on. So much so that one of things I have a bit of problem with is the pacing. Writer David Lindsay-Abaire has things move pretty quickly, but not too quickly that we don’t get a feel for the characters. It’s rather odd. We do get a good sense of the characters that we end up liking the family for the most part, but things move a bit quickly that we are almost forced to care about them too. We want to see Madison returned and the family is especially broken up about and leads to a pretty dramatic scene lead by Sam Rockwell’s Eric when he first meets Jared Harris’ Carrigan Burke. However, the big thing is the family is quick to think that it is a supernatural occurrence. Eric does play the skeptical one of the family, but the love for his daughter and wanting her back takes over. I’m not saying that’s a good reason to overlook the family’s acceptance that her daughter was taken away by evil spirits, but they could have played it out a little more. The surprising thing about Poltergeist is its sense of humor. Seriously, the movie and characters have a great sense of humor and Rockwell leads the charge with witty one-liners and the attitude of being the “cool dad.” But there is some more injected humor later on in the movie, that isn’t so much out of place, but actually fits with Harris’ Burke. The cast does well with what they’re given. Rockwell, Harris, and the youngest cast members Kyle Catlett and Kenndi Clements get the most work out of the movie. Sharbino’s Kendra has her moment but otherwise sits out the heavy action. Jane Adams’ Dr. Powell and Nicholas Braun’s Boyd also share a couple great moments, with Braun getting probably the best scare/tension scene in the movie, but Susan Heyward is really the one that gets the short end of the stick as Sophie as she really does almost nothing in the movie. Jared Harris could easily be a favorite, if it wasn’t for Rockwell’s good performance. Harris is having fun with his role and it shows, and thankfully, goes against type of this kind of character. The scares are okay. The majority of them are jump scares and only a few are actually effective. For the most part, Poltergeist works better as a creepy/haunted house movie as an opposed to a flat-out horror movie. My only real mention to the original movie is there are some callbacks to the original that fans will recognize. All in all, Poltergeist has some fun moments and has a surprisingly great sense of humor. What makes it work is the cast and the few effective scares. It isn’t perfect, but it isn’t that bad either.